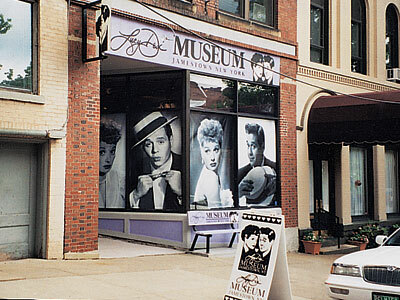 We recently enjoyed a visit to the Lucy-Desi Museum in Jamestown, New York — Lucille Ball's hometown. The museum is filled with rotating exhibits of memorabilia from the careers and personal lives of Lucille Ball and her first husband, Desi Arnaz, who starred together in the 1950s in television's beloved I Love Lucy. Be sure to see the town's three Lucy murals by local artist Gary Peters Jr. There are other Lucy landmarks, including her birthplace and childhood home. The town also holds an annual Lucy-Desi Days celebration on Memorial Day weekend as well as Lucy's Birthday Celebration (held the weekend closest to her birthday, which is August 6; that's August 5-7 in 2005). Jamestown is where State Highways 60 and 394 meet, just south of I-86 in far southwestern New York. The museum (212 Pine St.) is open from 10 a.m. to 5:30 p.m. Monday through Saturday and 1-5 p.m. Sunday from May through October; the rest of the year, it's open the same hours only on Saturday and Sunday. To learn more call 1-716-484-0800.